The installation of the Dark Rock Pro 3 is pretty straight forward and no different then other tower CPU coolers I have encountered in the past. The installation instructions were clear and easy to read and at no point was I left scratching my head as to what to do next. It is good to see that there is zero plastic or springs involved in the assembly or installation, as I haven’t been a big fan of either with other CPU coolers. All of the components are very high quality, nothing feels flimsy or cheaply made. The only plastic pieces in the entire kit are retainer clips that are used to hold in the mounting screw, which are only present to help facilitate a single person install. Without the retainer clips, an extra set of hands would almost certainly be required. Depending on how your specific motherboard is setup, if the RAM slots are relatively close to the CPU socket, you may have clearance issues if you have tall memory modules (i.e. memory modules with excessive built-in heatsinks). So you may want to keep this into consideration prior to purchasing this cooler or memory (if you’re doing a new build). For testing, the ambient temperature is within a range of 75 to 77 degrees farenheit. This particular test system generally runs the Thermaltake Bigwater 850GT water cooled CPU cooler, which is configured for the CPU cool in a single loop by itself running through a 240MM rad. For comparison purposes, we will include the temperature results of the Bigwater 850GT to the Dark Rock Pro 3. Now comparing a water cooled solution to an air cooled may not be a fair comparison, the TDP rating on the Dark Rock Pro 3 makes it a compelling comparison. It is also worth noting that the particular Intel i7 4770k chip we have in our test system has historically ran a bit on the warm side. As it’s a well known fact that all chips are not created equal, and this is especially true in the case of the i7 4770k specifically, I wanted to note this as it’s very possible your temps could be lower than ours if you choose to purchase this particular cooler. For testing, we captured idle temps from the system 20 minutes after a power on, this allowed for the CPU to come up to a steady idle temp. For load testing, we used Prime95 with the CPU put under maximum load for 30 minutes. The idle temps for the Dark Rock Pro 3 were immediately impressive, only differing from the Bigwater 850GT by a couple degrees. The load temps were more impressive, as I was personally expecting a larger delta between the two coolers, given that we’re comparing air cooled and water cooled. The notion that water cooling is always better is still true, but it’s clear to see that in this particular case, the difference is not always significant enough to warrant the jump to water cooling and all the challenges it can bring. To get an idea of the Dark Rock Pro 3’s thermal profile, we decided to put it under our FLIR Thermal Infrared Camera. In the above images, the left was taken during idle temps and the one on the right was taken during load temps. As you can see, the 7 heat pipes and massive fin housing dissipates heat extremely efficiently with only a 2 degree differential between idle and load. What is more interesting to note in these pictures is the variance in overall system temperature between idle and load. At idle the maximum temperature of the system around the cpu socket is 38.8 degrees where as when at load the system shoots up to 50.9 degrees around the cpu socket area. The CPU cooler maintains its temperature with only a 2 degree differential which demonstrates the efficiency of their design to absorb and dissipate heat. 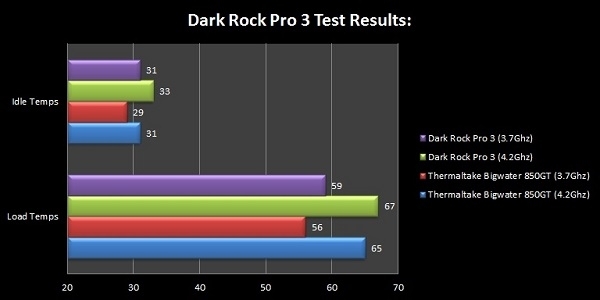 This becomes more impressive when you consider that the Dark Rock Pro 3 is a quiet solution.